The Common Arc Program conducts mass weld qualifications throughout the country with each welder obtaining a six-month certification from contractors and in some instances, the Owner community. 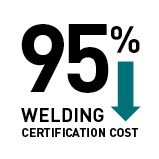 Welding certification costs to Owners and Contractors have dropped by 95%. Established in 1988, the Common Arc Program eliminates welder test redundancies and improves efficiency by creating a central location for welder certifications. This program has resulted in an average cost savings of 95 percent annually and eliminated costs previously paid by the Owners and Contractors, to ensure an efficient and rapid return to operation. The Brotherhood in conjunction with NACBE, created Common Arc as a separate corporation to eliminate test redundancies.